Berkhamsted Raiders Greens moved into the next round of the West Herts League U12 Challenge Cup with a deserved 5-0 win over Aston Clinton Colts. Raiders were dangerous on the flanks with Charley Hardy creating a number of chances. Noah Merriman stabbed home from a half-cleared corner before Finnlee Ferguson took his season’s tally to 25 with two accomplished finishes either side of half-time. 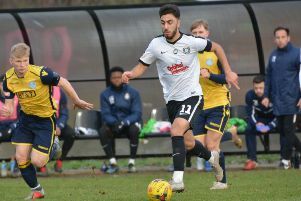 Jacob D’Cunha scored the fourth to cap a fine display in the centre of the park, running onto a precision through-ball from Zac Wallis to beat the keeper with a rising drive. Ten minutes from time Beau Kempster broke into the box and saw his shot blocked but Liam French was following up and smacked the ball home. “We have played some excellent football all season long, but today the boys showed that when they move the ball around and look for a killer pass in the final third, we are very hard to stop,” said manager Trevor Merriman.